« Prev Should I Tell Them About My Dating History? 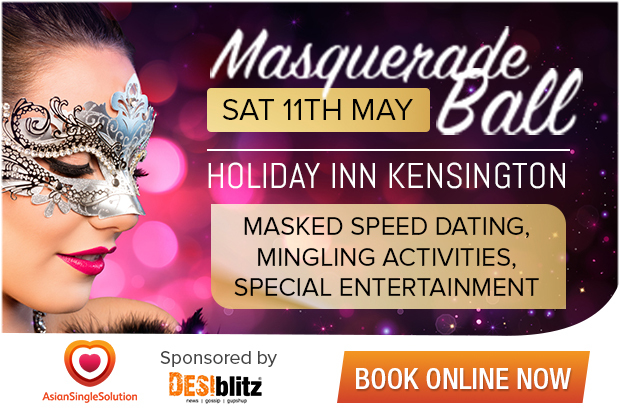 We are delighted to announce that we are running a very special May Masquerade Singles Ball on Saturday May 11th. For this party we will have masked speed dating, a chocolate fountain and 100s of lovely professional Asian Singles. We are planning some more surprises to make sure this is a huge event that will help you meet your match. Our balls have always proved hugely popular and always attract new faces. Tickets are limited and on sale for £30…but we do a few discounted launch price tickets available if you are quick. The event is sponsored by Desiblitz.com who will be running a fun ice-breaking activity during the evening. This entry was posted on Tuesday, April 9th, 2019 at 11:45 am	and is filed under Asian Singles Events News. You can follow any responses to this entry through the RSS 2.0 feed. You can skip to the end and leave a response. Pinging is currently not allowed.